Renters will always appreciate large, open and welcoming spaces that invite socialization, but small features can have a large impact when it comes to living spaces. Most will agree that plain white walls, while economical, don’t add much to a space’s overall appeal. When paired with fluorescent lighting, white walls can make a space feel downright clinical. Opting for beiges or grays can increase visual appeal instantly, without risking going out of style in a season or two. With the ever-growing list of personal electronic devices carried by the average American, easy-to-access charging capabilities are a must. Installing outlets with built-in USB ports is a quick and easy way to add functionality and convenience to any space. One of the best things property owners can do to increase the visual appeal of their property is to maximize the great assets that are already in place. Exposed wooden beams add instant character. Have an exposed brick wall? Don’t cover it up or whitewash it. Instead, add open shelves and let the wall become a showpiece. The kitchen is, without a doubt, the heart of every home. Older building designs tended to separate kitchens from the rest of the living space, but now is the perfect time to bring things together. If at all possible, open the kitchen to the living space to create a warmer, more welcoming and more social space for renters to enjoy. Most would agree that the larger the kitchen, the better, but even small kitchens are desirable if they’re highly functional. That means counter space and storage space are essential, and high-quality appliances that simplify cooking are smart investments that will increase renter satisfaction. Again, functionality is the single most important factor of a good bathroom design. Even if the bathroom is small, if it is easy to use the space, renters will be happy. Convenient towel racks, high-quality shower heads, large mirrors and an easy-to-clean vanity are simple upgrades that can make a big difference in functionality. Ample storage is also essential to a highly-functional bathroom – that means a small medicine cabinet will not suffice. While pedestal sinks look nice and create an open feel, we recommend vanities with drawers and cabinets that make storage easy. If you have space to add a linen closet or open shelves, residents will thank you again and again. We may be your trusted appliance experts, but we also like to keep a watchful eye on the multi-family industry as a whole. Interior design trends often influence appliance features and finishes, which in turn can play an important role in the appliances our clients choose for their properties. 2019 looks to hold some significant shifts in interior design trends, and while not everything will make sense for a multi-family property, there are some great ideas to consider if you’re planning an apartment renovation in the coming months. 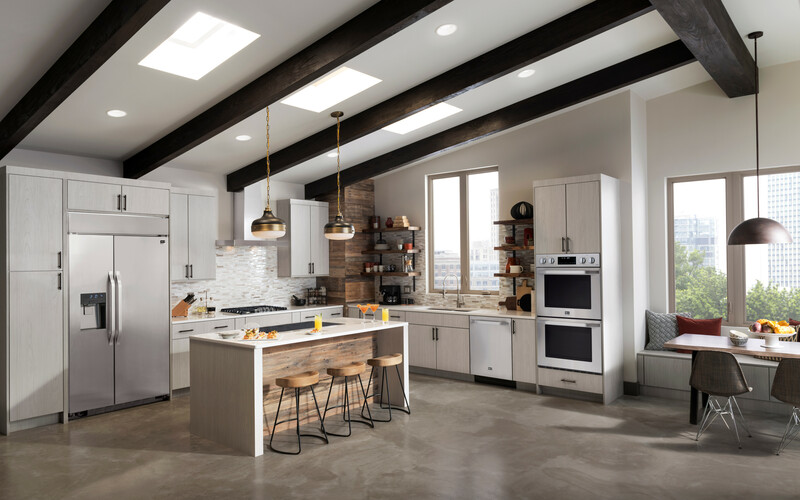 Check out our list of the Top 5 Apartment Renovation Trends to Watch In 2019.